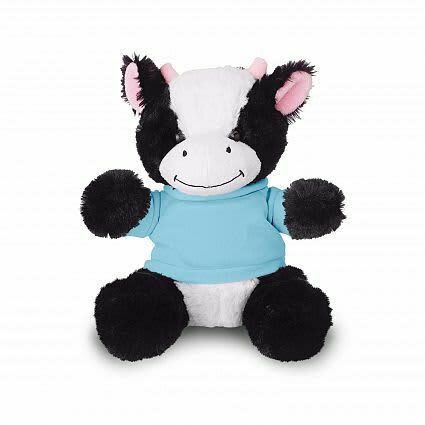 Boost brand awareness and develop customer goodwill with the Small Custom-Printed Cuddly Cow. This 15cm plush toy comes with a choice of 14 tee shirt colours which can be branded with your company logo or messaging. This cute, cuddly plush animal is ideal for developing brand recognition and creating goodwill. Cow: Black/White. Shirt: Heather Gray, Athletic Gold, White, Orange, Pink, Red, Lime Green, Forest Green, Light Blue, Royal Blue, Navy, Purple, Brown, Black.